What happens if you involve young people in decision-making about the areas where they live? This is the key question that guided SUSPLACE fellow Lorena Axinte during her research in the Cardiff Capital Region. Follow her footsteps and find out more in this short movie! This video is the first in a series of short videos that illustrate inspiring examples of place-shaping practices in Europe. In the past three years, SUSPLACE fellows have been looking at a diversity of cases, trying to understand how citizens, (social) entrepreneurs and community initiatives develop sustainable practices and build the capacities to transform their places according to their ideas, needs and demands. The videos aim to bring these practices, and the research findings, to life. To document Lorena’s research project, Anke (SUSPLACE coordinator and video producer) and Samuel van Rozelaar (MSc student and filmmaker) travelled to Cardiff last November. 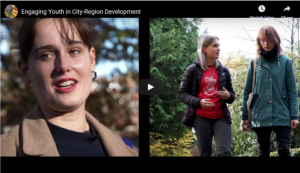 Lorena wanted the video to reflect the essence of her research project: giving young people space to talk about their own experiences, perceptions and aspiration for their city-region(s). Thus, she invited a few of her research participants to star in the video, so that their ideas could be portrayed without any filters. Filming turned out to be fun but also challenging! Despite being very fortunate with the weather (hardly any rain), temperatures were low and filming outside involved freezing interviewees whose faces turned blue in front of the camera. Recording inside presented itself with its own difficulties: how to find a space with a nice atmosphere that’s quiet at the same time? When we did finally find a nice and quiet room in Chapter Arts Centre, a flamenco dance class began in the room above. And then we came across technology issues: despite our numerous checks and back-ups, we lost an entire audio-recording of an interview. That required Lorena to appear in front of the camera for the third time to yet again explain her research in simple terms to the audience! We’ll make sure to consider them for the other videos in our series: Catia Rebelo’s work on place ambassadors in Portugal and Wales, Elgars Felcis’ work around permaculture and rural revitalisation in Latvia, Marta Nieto’s work on the commons in Galicia and Angela’s work on green care in Finland.